I wanted to make sure the demo encompassed more than just the tutorial area, to really give demo users a feel for how the game plays. So the demo lets players explore Anagoge (the newbie island), Serbule, and Serbule Hills, as well as most of the dungeons in those areas. Demo characters can unlock new skills as usual, and they can raise any of their skills up to level 15. This gives demo'ers a broad sampling of the game's content to explore. Once they buy the actual game, demo characters automatically become "real" characters without any restrictions, so it's quick and painless to transition from the demo to the regular game. We want to let our amazing community help Demo players if they get stuck or have questions, but it has to be easy to opt in and out. That's why we've tied private messages to the new Demo chat room. If you want to help Demo players, simply join this chat room. (Right-click a chat tab, choose Edit Chat Tab, and add "Demo" to the tab's channels. Or you can type /join Demo to quickly create a new chat tab for it.) While you're in the Demo chat room, you'll also be able to communicate via PMs with demo users. If you leave the Demo room (by closing the Demo chat tab), demo users will be unable to PM you further (and vice versa). Demo users are still bound by the same code of conduct as regular players, and demo users that are abusive will be gagged or banned as usual. And you can always use /ignore to ignore obnoxious users. But since it's so easy to create new demo characters, we wanted this extra layer of abuse-protection for our community. To sum up: If you're happy to help demo users, join the Demo chat room. If it becomes too distracting, just leave that chat room. No design is ever perfect on the first try, so I'm sure we'll need to tweak these rules after we see what problems demo users run into. But I think this is a good first version. We've talked before about the next big engineering task, which is rewriting the animation code to use Unity's newer 'Mecanim' system instead of our current home-brewed system. This coding work has been outsourced to our partners, who are developing it in a separate code branch. Unfortunately, it's taking longer than anticipated, and I'm not yet sure when the new animation system will be ready to integrate into the game. That also means horses are delayed, because the mounts need Mecanim. In the mean time, we're working on other parts of the game: improving the UI, fixing bugs, adding missing content, and revising game systems. Plus adding a few more new game systems to keep it interesting. The next update has some iterative improvements to the UI. For instance, it seems that a lot of players never find the "More Info" feature for items. (You currently find it by right-clicking an item and choosing 'More Info', and it can tell you things like who to gift the item to... no note-taking necessary!) I'll be adding an alternative way to get to that info so that it's easier to discover. 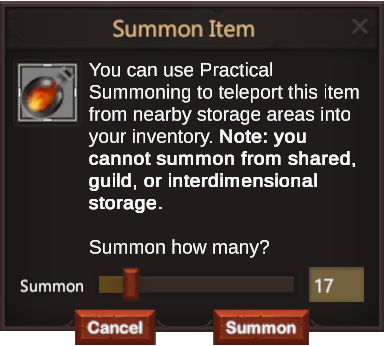 More substantively, there's a new little feature called Practical Summoning. This is designed to make it a little easier to manage crafting ingredients. I can't count the number of times I've been trying to craft something and realized I forgot an ingredient and have to run and get it from storage. 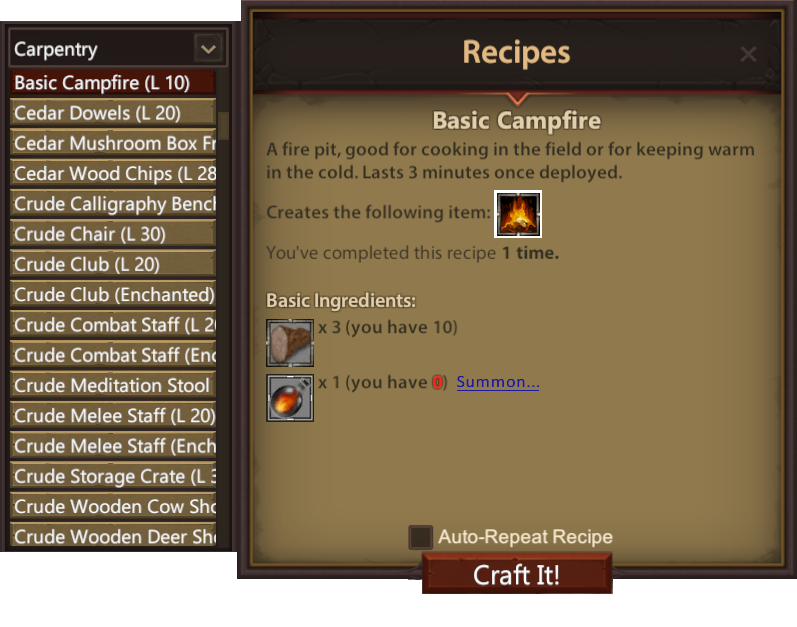 Once your character masters Practical Summoning, there's a new button in the crafting window to summon missing ingredients. (As shown by the "Summon..." link in this in-development screenshot.) Clicking that button lets you summon items from nearby storage areas -- all the storage in the current town you're in, more or less. There are a few caveats -- namely, it only works on fixed ingredients, not ingredients that you drag and drop into recipe slots. And it can't help you put stuff away after you're finished crafting. But I'm enjoying it and I think it'll be a nice little quality-of-life improvement. You'll be able to learn this trick from a mantis in the casino -- it costs a few thousand Councils and requires Teleportation level 12. The next update also fixes a bunch of annoying UI bugs, and there are some other new UI features that I don't want to talk about yet (because they may not work out... they're still being prototyped as I write this). And there are, of course, many more UI improvements to come in the future, too. Over the next few months we'll be taking a look at the higher-level areas: Kur, Ilmari, Rahu, and Gazluk. These areas all need more points of interest, more things to discover, most stuff to do! There are also a bunch of unfinished NPCs in these areas, and even entire storylines that just haven't made it into the game yet, plus some missing dungeons (a few larger ones, but mostly smaller soloable ones). Some areas will also see heavy revision for technical reasons. In particular, the terrain of Rahu will probably need to be remade. It was created via a different method than the other outdoor areas, as an experiment. We'd hoped this new method would work better than it did. (But hey, that's what experiments are for.) We'll be revising it to use the technique we used in other outdoor areas. This game has a lot of game systems. A LOT of game systems. Many are pretty nicely fleshed-out, but some are basically just prototypes that need a lot of revision. I have a long list of systems that need to be improved. Some of those systems include mushroom farming, "dangerous improvement" recipes, guild features, and several combat skills. Some of these things just need tweaks and refinement, while others may go back to the drawing board entirely. Note: All This Will Take Several Months! I don't want to give the idea that all of this stuff will happen in the very next update, which is only about a week away. The next update is mostly UI stuff. We like to work in short sprints of two or three weeks, so we'll be rolling these changes out piecemeal over several months. This way you get access to the features ASAP, and we get timely feedback. A big advantage of this work style is that we can pivot to new priorities very quickly. And we often do just that! When the new animation system is ready, it'll probably be higher-priority than a lot of these tasks, so unfinished tasks on this list may go to the back burner. However it goes, I'll keep you posted!